Today, hardly there is an individual who doesn’t have a social media profile. From the young generation to the elderly age groups, people of all ages are increasingly using social media to establish a connection and stay in touch with their friends, colleagues, and business prospects too. With widespread exposure and convenient networking facilities, social media has proven to be a great and effective way to not only build your company’s reputation but also do personal branding as well. Importance of social media. 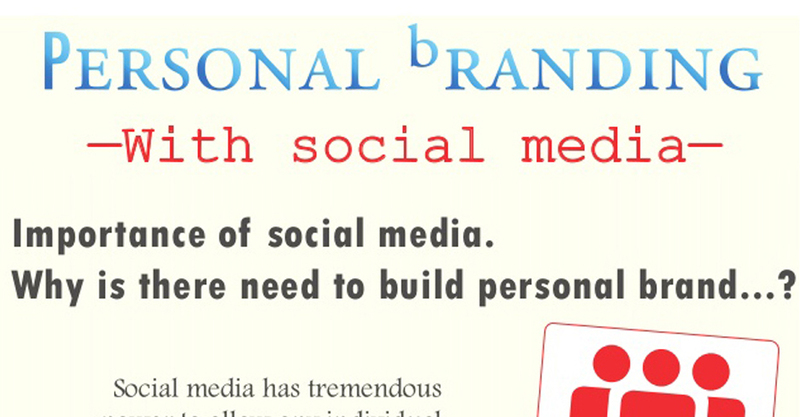 Why is there need to build personal brand…? Social media has tremendous power to allow any individual to keep in contact with enormous members. In order to build online brand, it very O essential to know all possibilities, all well as all the activities that are working together. Social media is contribution positively to the brand that any individual is trying to build. Cover photo is used to display your personality. It allows users to express their views and thoughts. Add milestone and experiences that further enhances your Image. Linked in a Business-oriented professional website. Users can join register themselves in professional website. The users profile will allow them to connect to people in the network. It allows individual to group their contact into circles. Regulation of information takes place among individual. Every user has a profile that displays information about them. It is a micro-blogging platform that allows you to share updates. It is possible to join conversation in real time. Searching any kind of information is possible that interest individuals. There is update of latest news. Easy to format, no need of extra coding. Adding widget is very easy in social media.